Grep av karbonfiber med freste dekorstriper grepet. Drop point blad i rustfritt S35VN stål med utstikkende tange for flipper funksjon. The Ki4496 Desert Dog flipper by Kizer Cutlery is a collaborative project between Kizer and custom knifemaker Mike Vagnino. A hand-filling handle with a wide blade, the Desert Dog was born in response to requests from the warriors of the armed forces. 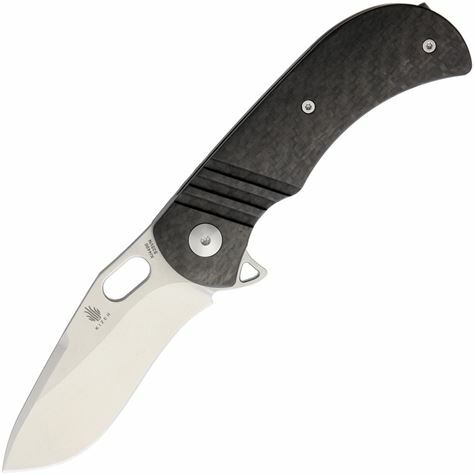 It features a 3.17" recurve drop point blade made from CPM-S35VN stainless steel with a built-in sharpening choil. The bearing pivot system allows for smooth blade opening, as with all Kizer knives. The ergonomically curved handle is made from carbon fiber over full titanium liners for maximum strength. Always searching, this hound craves the next adventure.